If I am doing my math correctly, then I count 41 days from today until October 9th. While that is not day one, that is the opening game for my Blackhawks in Dallas. The White Sox have stunk up the 2014 season (except for soon to be 2014 ROY Abreu, and a sweet goodbye to Konerko). The Bears are going to be lucky to win eight games this year, and frankly I could care less. The Fire....well... they need a bunch of help. We'll see about the Bulls, but at best they are playing golf after the first round of the playoffs. And if Rose gets hurt again, I'm going to call it: wasted draft pick. But my beloved Indian Head sweater is back in action, chasing the Kings to get back the Holy Grail. I don't buy much hockey. I didn't like the offering from Upper Deck the past year for the NHL. Though, if I see cheap boxes during Christmas online, I'm picking some up. And Score is nice, but it's hard to set build from my LCS and card shows. Not a lot of commons out there. Luckily, there are two Canadian traders out there I can count on for my needed hockey cardboard. Good eyes. You are correct in noticing those are not hockey cards. These Leaf cards are courtesy of JD at Sportscards from the Dollar Store. 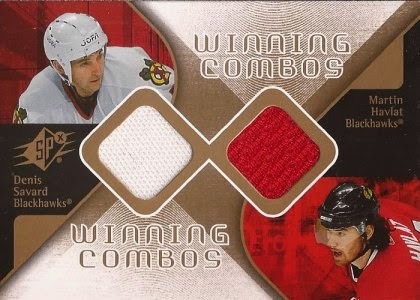 JD rips a crapton of repacks, and I believe, after pulling any nice goalie mask cards, I get the cast off Hawks. Like failed rookies. Ruutu has better potential, but is now a third liner in Jersey. Pirri is developing too slow. A change of scenery in Florida could help him, if he makes the roster. McAmmond never materialized into what he could be, and frankly - I blame that poodle 'do. 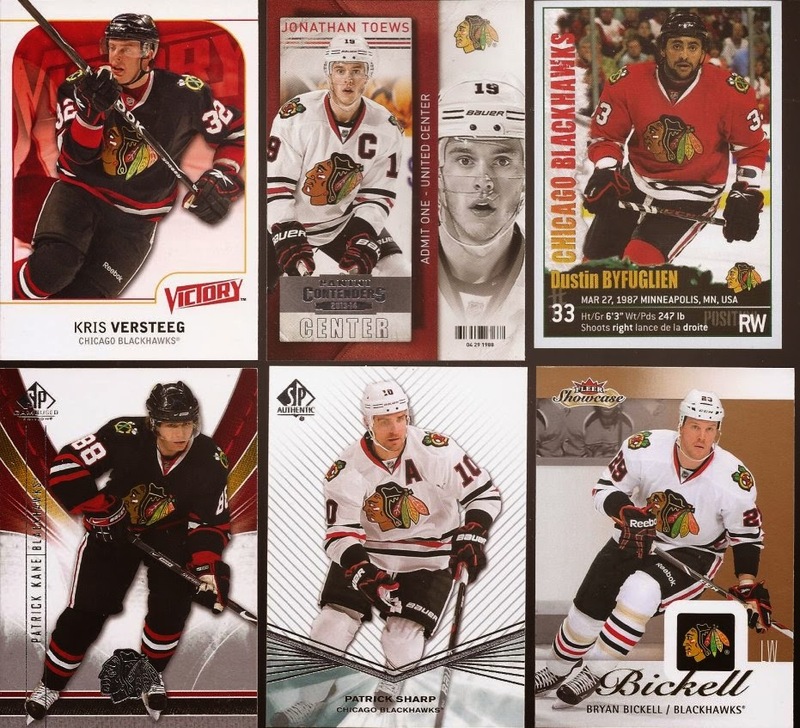 Also some newer cards of Hawks alumni. Roenick should have never left the Hawks. And if you hear him talk, you can sense it from him as well. Pappin is a two time Cup winner with the Leafs and then gave 7 really great seasons in Chi-town. Here's 6 guys all with their name at least once on the Cup. Love that Byfuglien sticker in the upper right. 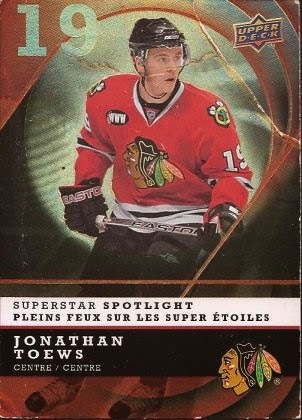 I do like the Panini Contenders card of Toews. This last card is a great addition to my hits binder. Savie and Havlat - oh hell yeah! You can see the difference in the material from CCM to Reebok. Thanks a bunch, JD. My other Blackhawks hookup comes from Kyle at would you friggin' start a blog already, Kyle!! Kyle and I PWE back and forth. His latest contained these gems. Have to put Hendry in the list above of failed rookies. Though, he did destroy his knee, so it's lucky he is still playing anywhere right now. I love that 75th anniversary patch you see on Roenick's sweater. That was also the better NHL logo in the center of the "75". Kyle also sent a custom card, created by his cousin. Yeah - the customizing was to crumple up the card and crease it in a few places. I think he may have slobbered on it, too. This is not a horrible incident or a tragedy. The card will still find a place in my collection. Thanks again, Kyle. Haha, not a custom. McD's insert from a couple years back. And no slobber ;) luckily caught it in HER hand before it went too far.